Makeshift is a social entrerprise that finds buildings or pieces of land which are not being used, they then work with local people to find out what they need, and finally they design and build a new function for the abandoned space to house communities of local and independent businesses. All their projects focus on providing the space and support for talented people. They aim to make the space as affordable as possible. Peckham levels was an abandoned Sainsbury’s car park situated just next to the high street of Peckham, Rye Lane. The car park became disused due to the decline in popularity of cars in the area and, as a result, Southwark council had planned to demolish it. A local activist, however, started a campaign to save the building, which is also home to the most popular independent cinema in London, a significant community asset. Makeshift then approached her to think of a new way to use the building to incite the council to keep it. That is how the Peckham levels project started. Peckham Levels is a temporary project that provides affordable space for independent local businesses, artists and local entrepreneurs to work, grow, trade and learn. It houses several workshop spaces inviting the public to learn new creative skills and is hoping to open up a market through which the artists and businesses can expose their work. It also has a rooftop open during the summer with spectacular views of London and a food court and bar. The project aims to support business growth so that they can then afford a more permanent and suitable space elsewhere. The project is set to last 6 years, with the opportunity to renew the leasing contract. Walking through a reconverted car park was really interesting and quite peculiar. The infrastructure was still visible but the space had been used to it’s full potential and very cleverly. The abandoned building has been given a second chance and is now full of life. 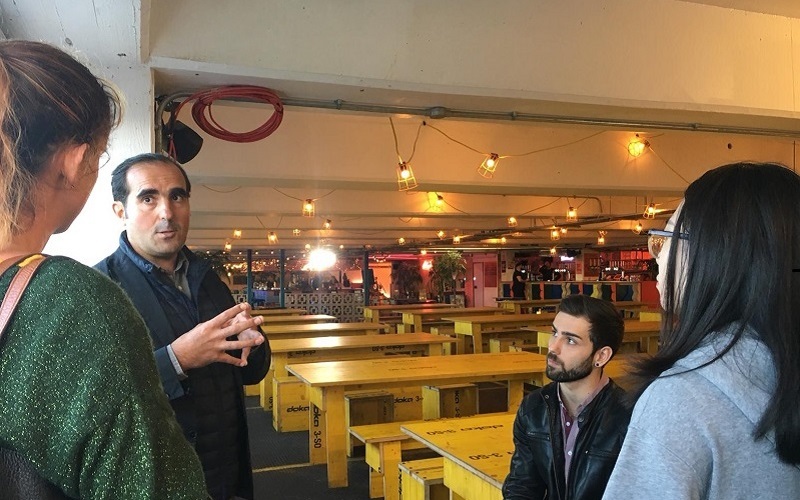 Whether it will encourage further gentrification of the area, that is another topic... Makeshift’s principles are to work with local people and offer a space that is genuinely needed in the local area. It aims to offer space to those who can’t afford it, and thus encourage the creative industry to grow. 80% of the businesses present in the building are local, and another 1500 businesses are on the waiting list to get some space. The demand is high. However, the food court’s demographic, while eating there, was not representative of the population that we had seen walking down the high street. Whether it is because this sort of initiative caters to a certain section of the local residents, I do not know. It raised interesting questions among the group about how such value uplift is captured and where it should be reinvested. All in all, this visit was great, and encouraged us to think about how derelict and abandoned spaces could be used, the conflicts in place and the implications they have on the local areas. We all then enjoyed a beer and a burger overlooking the busy city from far away.